We manufacture advanced, multifunctional, portable equipment for psychological training with neurofeedback and biofeedback methods. Biofeedback is based on measurement of selected physiological signals (e.g. muscle tension, pulse, skin temperature) and their affordable feedback presentation to the training person. It enables to increase awareness of the ongoing psychophysiological processes and degree of their control in order to function better, e.g. increase concentration or reduce stress level. 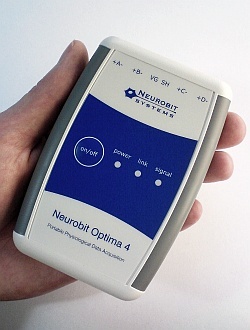 Neurofeedback is a kind of biofeedback, which uses signals deriving directly from the brain, e.g. encephalogram (EEG). We invite you to learn more about our products. Neurofeedback and biofeedback more accessible than ever.